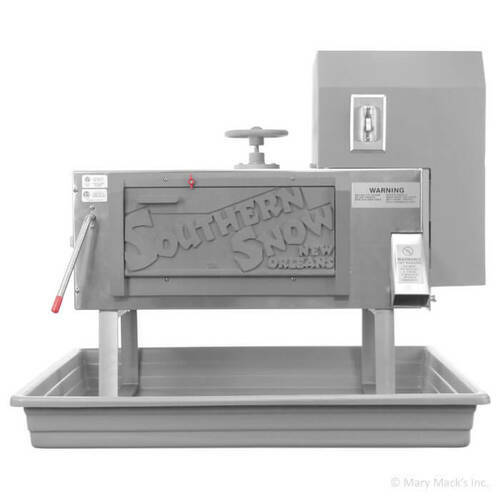 The Southern Snow Block Ice Shaver is the best-of-the-best when it comes to block shaved ice machines. It produces high quality fluffy, snow-like ice that will keep your customers coming back for more. It's so soft, the ice will absorb the flavor throughout the entire serving with delicious flavor in every bite. The Southern Snow snowball machine is made of stainless steel with aluminum castings for durability. The tri-blade cutter head shaves a solid block of ice into fluffy snow with ease. 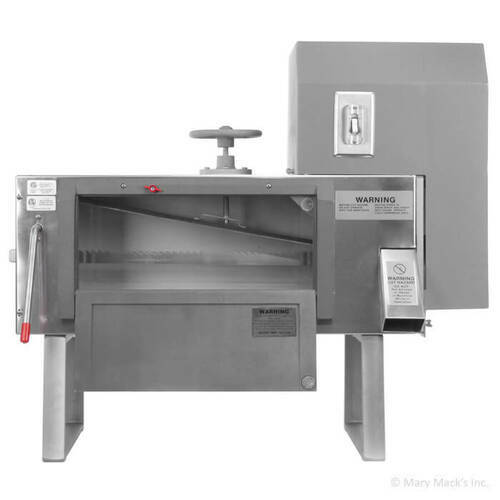 This NSF Certified and UL Listed machine to feature a safety motor cover to prevent the operator from brushing against the motor with wet hands. 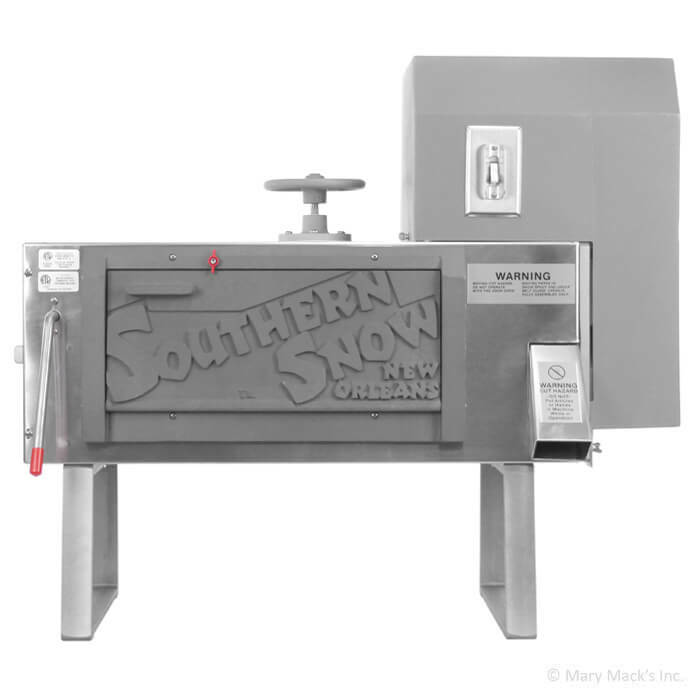 The double throw, industrial on/off switch provides years of trouble-free service and a snow control lever allows the user to have complete control snow production. 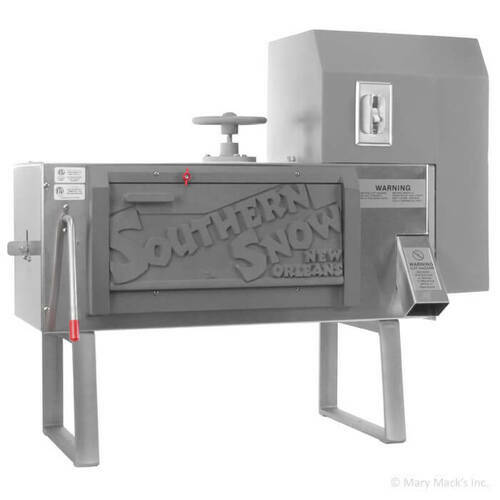 Manufactured by Southern Snow, this snowball machine includes a lifetime warranty on the machine and a 6-year warranty on the motor - it will truly last a lifetime. 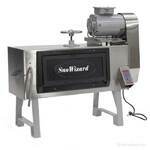 It's a remarkably quiet machine that can shave hundreds of fluffy servings of ice per day. Included with this ice shaver is an additional set of blades and a large plastic drip tray with a threaded drain to easily connect your drain pipe. The tray measures 33.5" L × 4" H × 24" W . The machine is constructed with space saver legs, allowing the operator to position it on the rear of the drip tray. This allows for any ice over-spray to fall freely into the tray. The Southern Snow block ice shaver can do it all - except make the ice. We carry ice molds to easily freeze rectangle blocks of ice for this shaver. 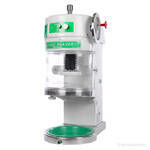 Visit our Shaved Ice University resource center for more information regarding block ice shavers. You will find helpful tips, recommendations and much more to help you get your snowball business started. Before purchasing any of our shaved ice machines, we recommend reviewing every resource we offer which is completely free! 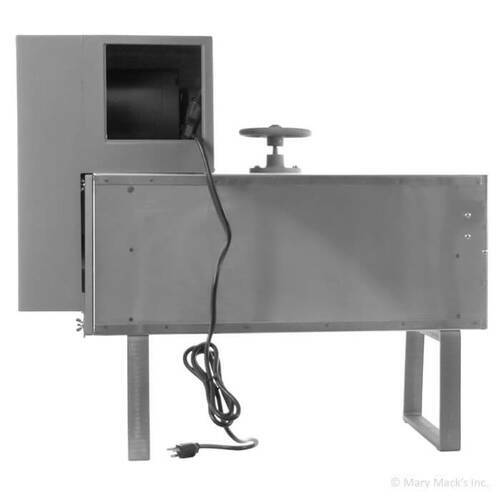 Drip Pan Dimensions: 33.5" × 4" × 24"
Ice Block Size: 14" × 5.5" × 5.5"
Shipping Dimensions: 36" × 27" × 23"
This item ships in 1-2 business days from our warehouse. Transit times vary based on the shipping destination. This item is shipped via LTL Freight. Shipping costs are based on the weight and dimensions of the item along with distance from our warehouse to the destination. Someone 18 years or older must be available to sign for this machine upon delivery.